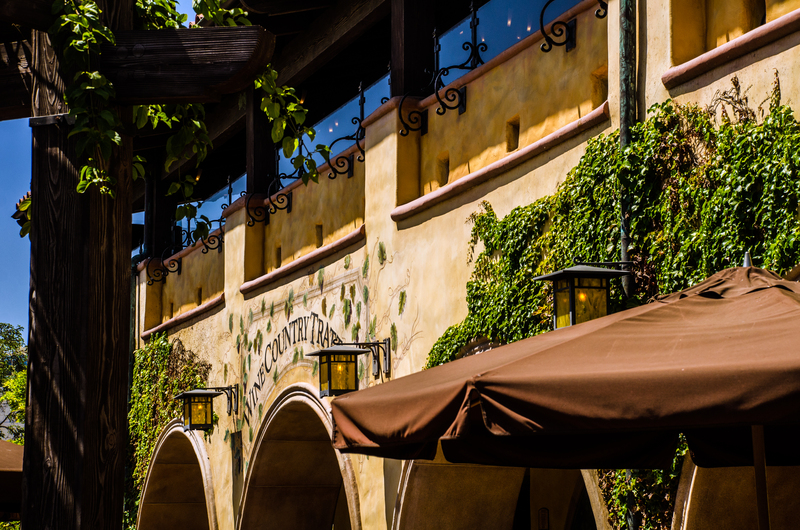 Located in one of the quieter parts of Disney’s California Adventure, Wine Country Trattoria offers Tuscan flavors as the restaurant tries to give it’s best Napa Valley impression. Pasta, salads, sandwiches, and a few specialty items are offered here. Wine Country Trattoria is open for lunch and dinner and entrees run between 15 to 25 dollars, generally. 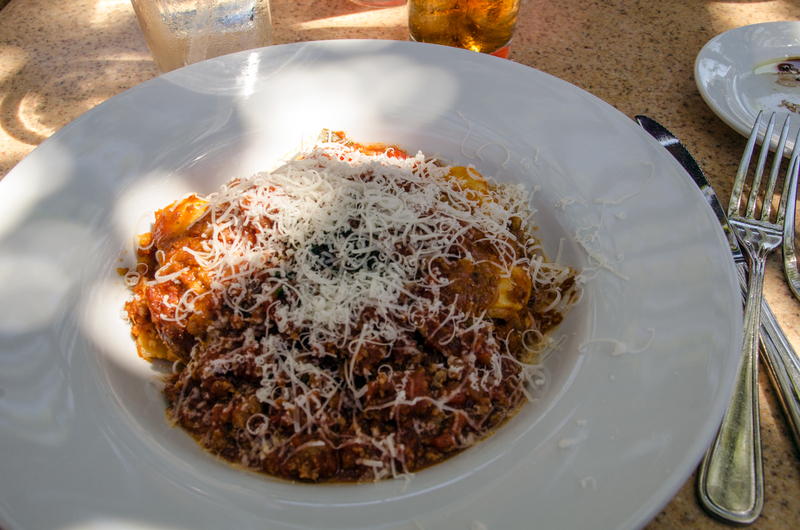 We visited the Trattoria on our latest trip to California and this review will be based off of that trip. 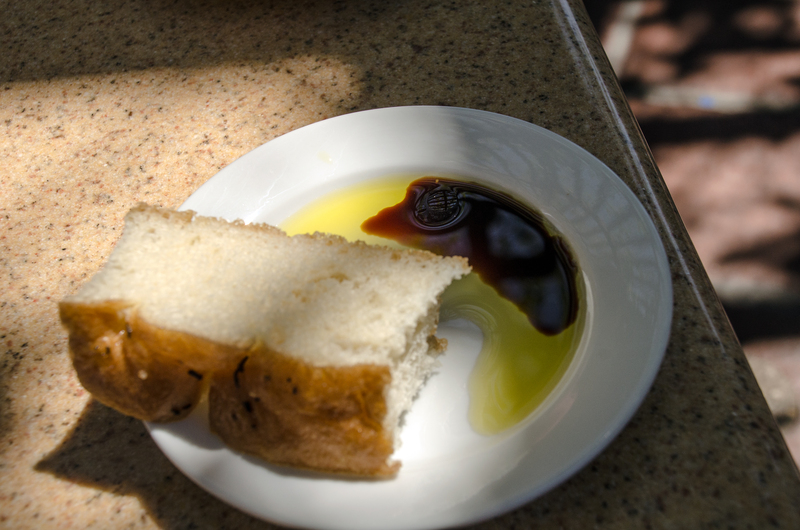 The best thing Wine Country Trattoria has going for it is the locations leading up to the restaurant. 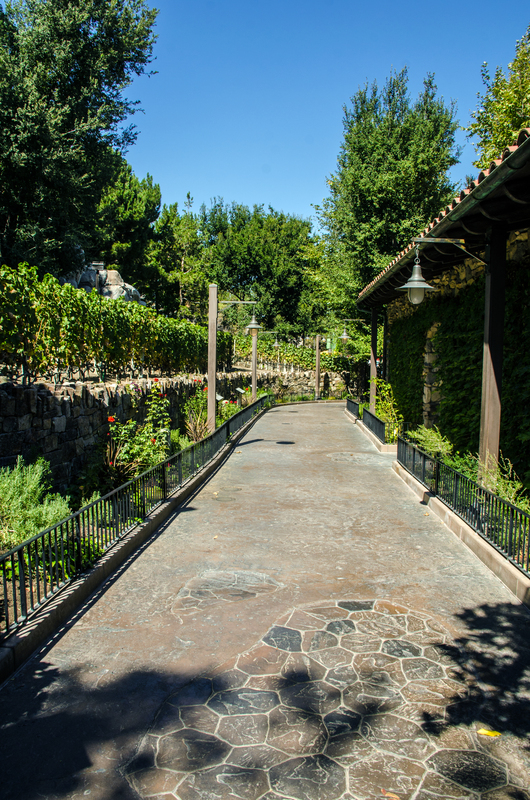 If walking to the restaurant from the entrance of the park, you would pass the hustle and bustle of Cars Land and then happen upon a tiny little vineyard that is growing. If coming from the Paradise Pier side of the park, you slowly drift away from the business of the pier, pass the Pacific Wharf and enter into a pretty calm setting. Either way, the walk to the restaurant slowly changes into a more relaxed atmosphere as you draw near to Wine Country Trattoria. The restaurant itself has a fine atmosphere. When we were there, they were not using the seating inside of the restaurant (the park wasn’t busy enough to justify opening that section). I would imagine the inside portion may have better theming, as it’s hard to theme open air. The indoor section is housed in a beautiful building that looks rustic and fitting of the northern California area. There are soft colors everywhere, making diners feel more relaxed. If you are lucky, you will be able to have a view of Paradise Pier while sitting outside. If not, there are still some interesting items to look at. The outdoor seating is completely covered with umbrellas and, when we were there, the staff was very helpful in making sure that we had plenty of shade from the hot sun. Unfortunately, the rest of our experience with the wait staff was just okay. There wasn’t much to complain about but it definitely didn’t exceed our expectations. The service was a little slow, without much attention to detail. We also felt a tiny bit rushed which, I know, contradicts the service being a little slow. Again, it wasn’t anything major but we’ve had much better service elsewhere on this trip. I’m not much of a wine drinker but this restaurant did have an impressive assortment of wines. While we didn’t order any, you can look at what they offer here. As far as the rest of the menu goes, there was a decent variety. The pastas and the salads seem to be what they concentrate most on but I did see someone next to me with a chicken sandwich that I immediately regretted not ordering. So, I went over and took it from her and had two lunches. Just kidding, I was making sure you were still paying attention! Congratulations if you knew I was joking, you win a prize that has yet to be determined. The bread service was tasty. I like a little variety to my bread and there wasn’t much here. But, this was fresh and tasted good. I would imagine that they bake it across the path at the Pacific Wharf every morning but I couldn’t tell you that for sure. 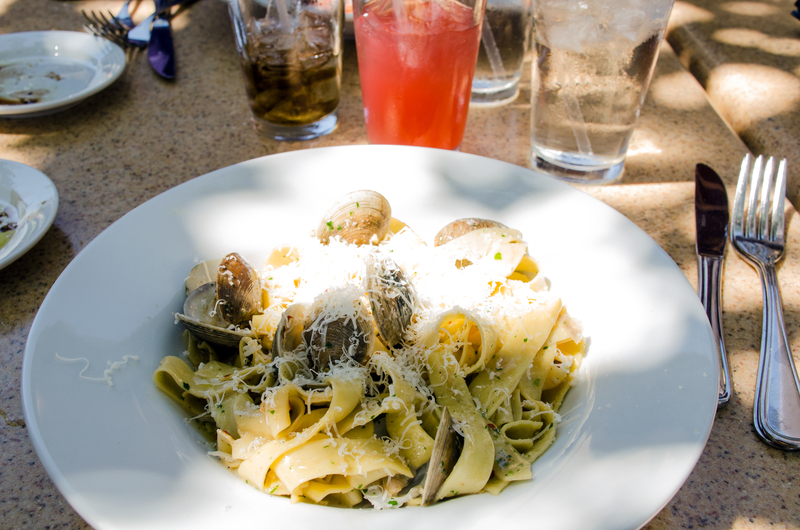 Melissa decided to go with the Alla Vongole for lunch which is pasta with clams. The dish was pretty light, for being a pasta. There wasn’t much of a sauce on it but the dish wasn’t overly dry. The clams were the star of the dish and were very tasty. Otherwise, the dish lacked a little bit of flavor. While have a light pasta dish is nice, I think the lack of sauce may have hurt the overall flavor (sorry for the shadows in the photo). I went with the Lasagna Rustica for my entree. To be fair, I haven’t earned my membership with the Lasagna Judges Committee yet but I thought this lasagna was pretty average. The pasta in it was good but not out of this world. I didn’t recognize anything that made the sauce stand out and the same goes for the meat. I thought the dish was decent but nothing more. I should have gone with that chicken sandwich. With many items still on our ‘To Eat’ list, we decided to forgo dessert and get it elsewhere. You can check out the dessert options on the menu I linked above. All in all, I thought Wine Country Trattoria was a little bit bland. The area surrounding the restaurant is beautiful but the restaurant itself doesn’t live up to that. The food was nothing I’d go back for. Melissa and I play this game on our trips where we rank all on the restaurants on terms of places we’d like to try again. Wine Country Trattoria finished last for both of us. While there was nothing wrong with our meal, there was also nothing special about it. About the best thing I could say is that it was better than Olive Garden (I don’t like Olive Garden). Without a major overhaul, I don’t think I would try this restaurant again. 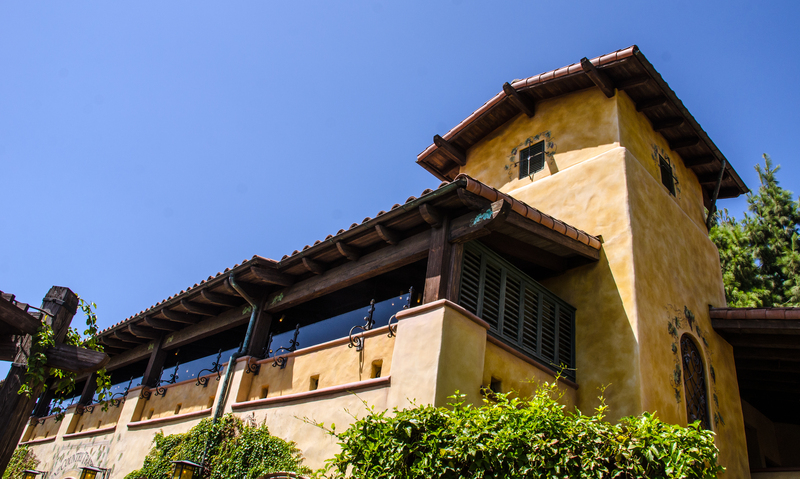 Have you tried Wine Country Trattoria? If you have, let us know your thoughts in the comments. Was my experience just an unlucky one? Does my lack of experience in judging lasagna show? Let us know and feel free to leave any Disney-related questions in the comments, as well. You can check out more of our dining reviews here. Thank you for reading!